Rolling forward into East Prussia, the Imperial Russian Army planned a two-pronged stroke against its German enemies. The First and Second Armies would surround and destroy the German Eighth Army, and then march forward to Berlin before German forces could rush back from the Western Front to stop them. The war would be over within weeks. Things did not turn out quite as planned. First the Germans surrounded and destroyed the Second Army at the Battle of Tannenberg, and then turned on the First Army and routed it in the Battle of the Masurian Lakes. Rather than ending in weeks, the First World War would last for over four years and end in the destruction of both empires. August 1914 is a stand-alone game in the Infantry Attacks series, our World War One equivalent to the long-running Panzer Grenadier series. Units are companies and squadrons, and the forty scenarios represent actions from the opening battles of 1914 in East Prussia and Poland between the Russian and German armies. Forces include the German Army's regular and reservist infantry, Landwehr, cavalry, artillery and the Prussian Guard. The Russian Army brings its own infantry, grenadiers, regular cavalry, Cossacks, artillery and Plastuns. 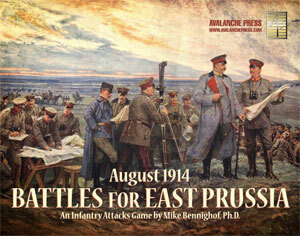 There are six semi-rigid mapboards, the same type found in Panzer Grenadier games like Eastern Front. 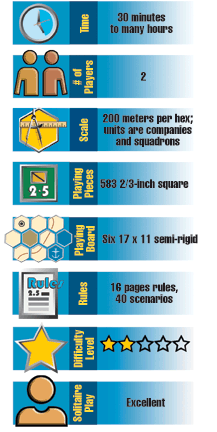 They are fully compatible with the Panzer Grenadier boards — you can play scenarios from either series on mapboards from the other game system.